Three unexpected things happened while I was in the Bay of Islands recently. There were probably around a dozen of us on the Taiamai Tours excursion: a group from my organisation, plus four actual international tourists, a couple from the US and a couple from the Netherlands. 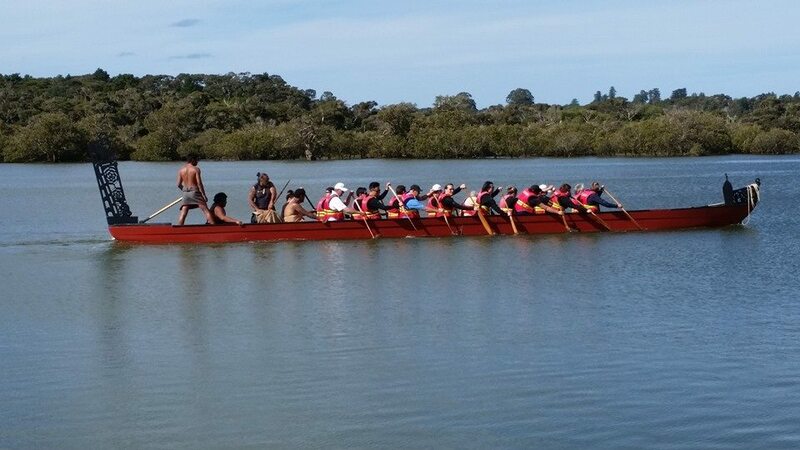 We rowed a little way up and down the Waitangi River, singing and chanting as we went, as tradition dictates. Let me tell you, it is hard going; my arms were burning after just a few minutes. We were lucky enough to have Taiamai Tours owner and tribal chief Hone Mihaka as our guide. Along the way, after he’d shared a few stories about the land and its history, he invited us to visit their marae, and we paddled over to the banks. I’ve been on large, more ceremonial marae before, but never to one like this: intimate, raw, rustic. We stooped to ease past the low roof, making our way over the dirt floor to the simple wooden benches lining either side. What a sight we must have been, still swathed in our garish lifejackets, but honoured and humbled to be there. The young boy who’d performed the welcoming ritual to invite us onto the grounds spoke for a little while, haltingly. Then it was our turn. Impressively, both the tourist couples also stepped up to say a thank you. We wrapped up with a waiata (song) – luckily, we’d been practising at work for occasions such as these. The last thing I expected was to learn something new about my suburb back in Auckland. I’d never given any thought to its name, but apparently it has a bit of a dark history. In anticipation of tribal uprising and potential war, a blockhouse was built down at the bay. On the plus side, it was never really needed. My intermediate school was big on arts, culture, and music, led by a fantastic Maori teacher, and all this made me nostalgic for those days. For me, this trip was a reminder that Northland isn’t just about dolphins, beaches, Cape Reinga and the Waipoua Forest; it’s also got a rich cultural heritage, including the Waitangi Treaty Grounds. What an interesting adventure and amazing opportunity. Thanks for sharing! I was rowing once in such a kind of boat and it’s hard for your knees. That’s a good more active sports! I’ve been wanting to try rowing out. Maybe this, I will.